August 2 New Moon @10Leo57 4:44:30 pm edt White House; New Moon in 8th house trined by a 12th house Saturn Rx (9Sag52); Hour of Venus which is at the end of Leo (26:35, also in 8th house); ASC 17Sag13 makes Jupiter chart-ruler from its own 9th house @22Vir24 conjunct US natal Neptune suggesting inspiration, but negatively hinting at unwise speculation, paranoia, fanaticism, inflation, and scandal. This Jupiter also conjoins the natal Mars of President Obama which can cause overestimation of strength, having a large part to play in proceedings, and/or success if moderation and caution are used. The midpoint of Jupiter and Neptune rise in this chart so the potentials for speculation and lack of realism are increased. 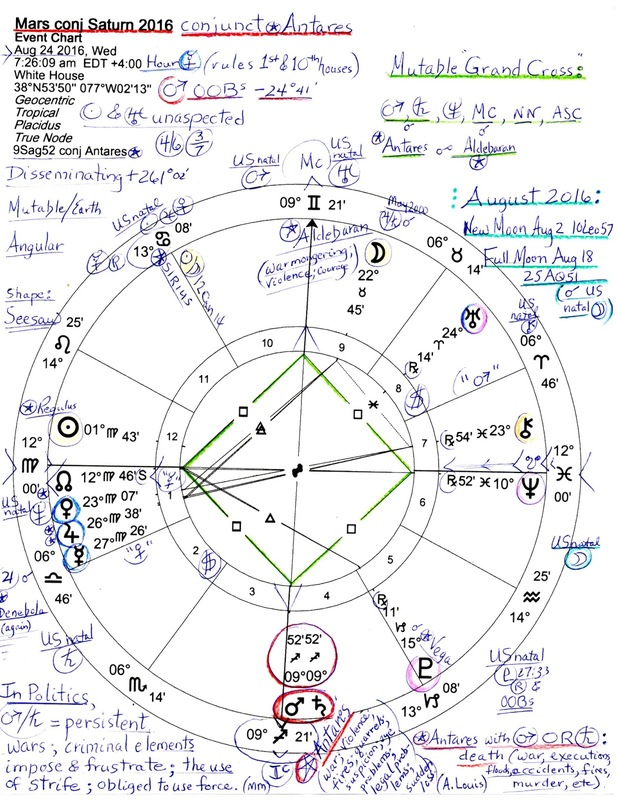 August 18 Full Moon @25AQ51 (conjunct US natal Moon/We the People) 5:26:30 am edt White House; Full Moon in 7th house of Partnerships and Open Enemies so the 1/7 polarity is emphasized between Self and Others with the Sun rising @25Leo51;ASC 13Leo23 conjoins Mr. Obama's natal Sun, and the Virgo line-up is in the 2nd house of the National Treasury, Earning Ability, and Values; Jupiter and Neptune rule the 8th house of Corporatism, Credit, Debt, Shared Resources, Legacies, Transformation, (Death, and the Occult) so there's a money/wealth emphasis across the 2/8 axis--and fraudulent Neptune @10Pis02 Rx is in the 8th house as is Wounded Healer Chiron @24Pis08 Rx (suggesting a mentor or mentors); Neptune and the Saturnian South Node are conjoined (1 degree 41 min orb) in 8th so the implications of loss through fraud or through weather disasters such as floods and storms are increased. Gas, oil, and toxic fumes are also possibilities as are catastrophes related to drugs, poisons, contagion or epidemics, and/or to soil erosion or upheaval (see Antares, below). As for the horoscope you see here with its Mars-Saturn-Antares flavors at the Ending or HOW? Point of the chart, their conjunction adds to the likelihood of natural disasters, quarrels, suspicion, belligerence, military action, violence, fires, explosions, shipwrecks, tectonic shifts, and/or other natural or man made catastrophes. Not a pretty picture at all, is it? Well, Mars-Saturn is often said to be the 'death axis' in a horoscope and as malevolents, one or both planets tend to be active during times of extremism and violent measures especially when Angular as they are here in Washington DC. Add Antares (alpha Scorpii; Watcher of the West) to the brew and the negative tendencies of Mars-Saturn with its frustrating stop-go energies can be invigorated toward destruction (including self-destruction), obsessive behavior, and dramatic turns of events. Murder (or worse, mass murder) and executions cannot be ruled out with such a turbulent trio which could very well affect masses of people. Plus, miners and laborers may be in the spotlight since the trio is in the 4th house. Opposite Antares is royal star Aldebaran (alpha Tauri; Watcher of the West; success through integrity; in Arabian Astrology, 'the one who follows the Pleiades') at the very visible Midheaven would seem to be related to The Goal (the WHY? Point of the chart) so there we have two royal stars completing a Mutable Grand Cross that expresses at the Public angle at MC. Please enlarge the chart for more details such as the actors in the Grand Cross: Mars/Saturn/IC/Antares, Neptune/SN/Descendant, MC/Aldebaran, and the Ascendant/NN conjunction. Also note the Seesaw shape of the planets weighted on the Virgo side which denotes the capability for major achievement while working under contrasting and antagonistic polarities (Jones). Not included in the Grand Cross pattern are an unaspected Sun and Uranus (Rx). 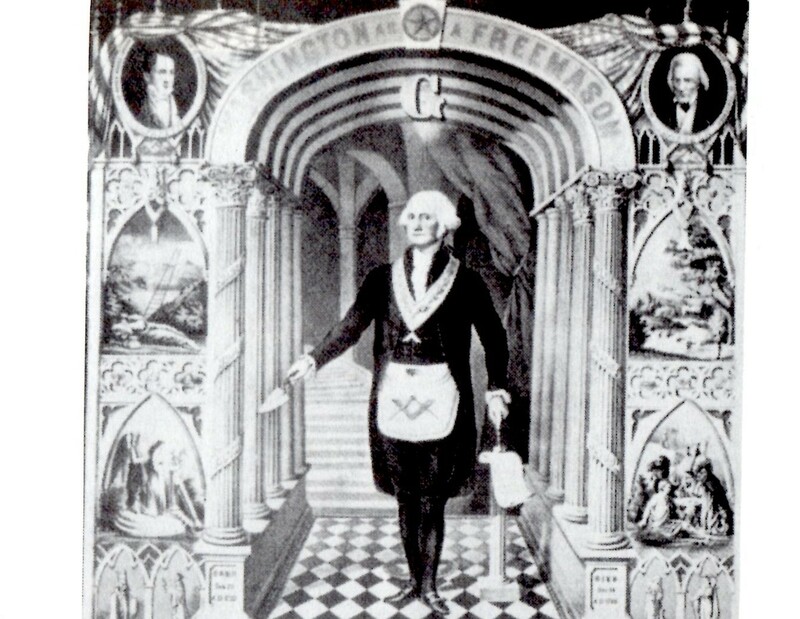 Unaspected, each planet tends to work within its own sphere of interests--the Sun in the karmic 12th house of Politics and Back Room Deals, and Uranus, anarchistic in Aries and possibly causing turns of fortune or fate in the 8th house realms already mentioned, above. 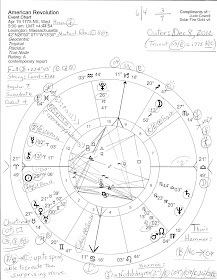 Other actors (planets) don't moderate or affect the solar and Uranian energies in this chart so that they are expressed without the support or interference of others. Aided by three applying trines, the Moon @22Tau45 is in the 9th house and signifies the populace in a Mundane chart. Practical Earth trines to the Moon coming from the 1st house trio of Mercury, Venus, and Jupiter in Virgo suggest that commodities markets, cyclical ups and downs, and legal matters are involved, and that fluctuations are being planned for. Taurus looks for preservation of values, increased development and growth, comfort, luxury, and possessions and these are the reigning needs of a Taurus Moon. (btw: 22Taurus is just beyond a Lunar Return for former president Bill Clinton whose natal Moon position is @20Taurus+.) Actually, a Taurus Moon in 9th house trined by two money planets (Venus and Jupiter) and the planet of negotiations and trade (Mercury) brings a hint of lawsuits with favorable outcomes to mind. Also not part of the Mutable Grand Cross is wealthy, powerful manipulative Pluto @15Cap11 Rx which precisely conjoins the 5th cusp, the house of Risk-Taking, Gambling, Speculation, and Creative Ventures. However, Pluto is connected to the Mutable Cross since it is disposited by major player Saturn via Capricorn, planet of structure, authority, control, government, law, and business. Of interest is the fixed star that Pluto conjoins, lovely Vega (alpha Lyrae) which provides such potentials as: good fortune in Politics, wealth via dealing with the government, double dealing, fleeting fame, and mother problems (A. Louis). Hmmm. Seems likely to me it might just as often indicate father problems with Saturn-ruled Capricorn involved! Now running in the background in August is the current Solar Eclipse (18 South) which manifested on March 9, 2016 @18Pis55 with its themes of endings, separations, and partings (Brady). Sadly, such themes support rather well the more difficult Mars-Saturn-Antares energies of August, don't they? And we've already seen 18 South manifested in both the Republican and the Democratic campaigns as staffers and officials have been let go or stepped down (ex: DNC Chair Debbie Wasserman Schultz). Yet 18 South includes a ray of hope for positive outcomes may result from the new conditions created under the influence of the eclipse. However, since August 23rd is within 2 weeks of the next Solar Eclipse (September 1st @9Virgo), its 19 North themes may affect the harsh trio conditions as well. Plus, a conjunction on an Angle such as we see here in DC can act disruptively itself in similar fashion to an eclipse or to the planet Uranus. In other words, these are 'wild card' energies being discussed here and the potentials may or may not express at all, one of the qualities of quirky Uranus which can act as a catalyst early, on time, late...or never! Plus, we can never reliably predict what Uranus is up to, can we? Especially when The Isolationist planet is further detached by being unaspected! And yes, the off-on Saturn-Neptune square applies again (1A00) which links back to their last Great Conjunction/s all through 1989--3 times from 10Cap22 (#3) to 11Cap14 and 11:55 where transit Pluto crept for the last few years leading to deep fears of loss and/or a feeling of being downtrodden--which is more than a feeling thanks to draconian measures taken by governments across the globe and to the degradation of moral standards in society (imho). My feeling is that repressive governments with hidden agendas are the main problem, not the people! For without racketeering governments and their enablers, war would not exist. Meanwhile, profiteering 'leaders' provide mere lip service to the cause of peace! Now perhaps you remember that for the first time since the late 15th century, the year 1989 saw a triple conjunction of Saturn, Uranus, and Neptune, thus thickening the planetary plot beyond the scope of this post although we should note that workers' and civil rights and a fair and just society were obvious areas of interest then and are on society's front burner again, often as 'income inequality' issues. You know, lowering the IQ score for entering police academies hasn't improved society at all for it represents degraded standards. 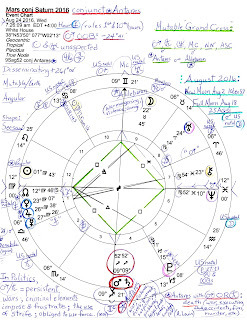 As for hotheaded Mars, the confrontational warrior planet applies to nebulous Neptune (1A00) in murky Pisces, an aspect that echoes America's natal Mars-Neptune square of misguided or misdirected energies, confused motivations, though occasionally inspired actions. However, we may expect this square to blow the fog of war up our apathetic (noses) as usual. Tragically for humanity, perpetual war is a primary goal of the power elite. 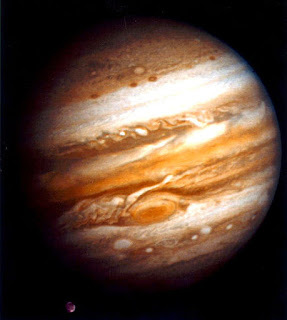 And corporate planet Jupiter conjunct starry Denebola in 1st house tells the tale: to go against society. Okay, I'll hush for now and hope that this downer post serves to inspire moderation, a strengthening of our community spirit, and perhaps thoughts for safety precautions during the month of August 2016 into September. After all, we have the September 1st Solar Eclipse of realism and tackling the truth approaching as we each ruminate upon which of two sub-par presidential candidates we'll vote for on November 8th--so please do not stay home!